To land an offer at the higher end of a salary range, applicants must demonstrate to an employer that they are worth the price. (CareerBuilder.com) -- While some employment opportunities state in black and white what wage an applicant can expect if hired, other positions are grayer in terms of salary. Talking about money with a potential employer might feel a bit awkward, but coming to terms that leave both sides content is crucial. 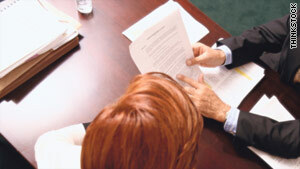 Below, experts offer suggestions on how to prepare for salary negotiations. Not wanting to look like they are only in it for the money, job seekers often hesitate to break the ice on the issue of salary. Is it OK for a candidate to bring up the topic? "I get asked this question by friends all the time, and the honest answer is that it depends entirely on the position," says Paul Peterson, national talent resource manager with Grant Thornton in Toronto. "If you are a campus hire, you do not ask upfront (first interview) as it can give the impression that you are solely money-focused. For experienced candidates, it's perfectly appropriate to bring up the topic, especially if you want to ensure that you are at least close in range." Anastasia Valentine, a product strategist and career coach from Ottawa, agrees that it is fine to bring up salary during the initial meeting -- but not as the first point in the conversation. If the employer doesn't eventually broach the subject, a tasteful approach is to ask for a salary range. Perhaps no question scares candidates as much as, "What salary are you expecting from this position?" The last thing the applicant wants to do is sell himself short, but he also might fear pricing himself out of the running. Jen Rallis, author of "Ugly Résumés Get Jobs," suggests turning the tables by asking, "What salary range are you willing to pay for this position?" Once the employer provides a range, the candidate can simply respond, "That's suitable" if the numbers are in line with his needs. Likewise, job seekers being pressed for figures can offer the employer a suitable range. To avoid making an uneducated guess, candidates should find out before the interview what similar positions in the field are paying. "Being prepared and understanding market rates for the worth of experience and skills not only demonstrates confidence and preparation, it also keeps the discussion on a factual versus emotional level," Valentine says. "This speaks volumes to an employer beyond the request for a specific dollar amount." Peterson advises choosing numbers carefully. "Candidates need to remember the cardinal rule when giving ranges: If you give a range, for example 60-75K, the employer generally remembers the 60 while the candidate remains focused on the 75. Be prepared to give a small range." Pointing out any extras that set you apart (advanced training, special certifications, knowledge of a second language, etc.). Ideally, both sides should have similar expectations regarding salary by the time an offer is issued. Yet sometimes there are surprises. "Call back the next day (do not use e-mail or any other electronic format where your intent can be misunderstood) and tell the interviewer all the reasons you'd like to work with the company but that after due consideration there seems to be a misalignment with their needs and the value you bring to the organization. Ask if there is a way to bring the two into better alignment. If there seems to be interest, make a counteroffer." Rallis agrees that most employers will leave room for negotiation -- if not on salary then on other benefits. "Ask if a car allowance, cell phone allowance or extra vacation days are available to compensate for a lower salary." Finally, try to view negotiations as seeking a win-win situation for all involved. An employer with enough interest to go through all the stages leading up to an offer has already invested a fair amount of time and energy. The company may be just as eager as you to make things work.